Saline water intrudes into rice fields in Rach Gia City, Kien Giang Province in the Mekong Delta, Vietnam. The Mekong Delta, Vietnam’s biggest granary, home to a widespread network of rivers and canals, has been threatened by the rising level of salt water flowing into rice fields and farms. There have been warnings about such a situation for years, but authorities in Vietnam have failed to work out measures to solve the issue. Climate change has become more serious and its adverse impacts can be seen now in the region, not just in forecasts as before. Many areas have no fresh water, and saline water has increased amid the rainy season. Other areas have experienced land subsidence along the banks of rivers. During this month, which is part of the rainy season, many areas in the Mekong Delta have been ravaged by an increase of salt water in rivers and canals. More importantly, the areas had not been through such a situation for decades. Hung Phu Commune in My Tu District of Soc Trang Province is one example. Fruit trees have withered and aquaculture has been badly affected by the presence of saline water. “We have never seen this situation in the area before,” said Vo Van Dep, who has 25,000 fish on his farms. “Several days ago, aquatic plants floating along the river’s surface were faded. Now all my fish are suddenly dead,” he complained. “We can treat it if a fish dies from diseases, but we give up when it’s gone because of water like this. Around 70 households raising fish in Hung Phu have suffered great damage caused by salt water. In addition, 700 hectares of fruit gardens along the Quan Lo – Phung Hiep River have been badly affected, as locals cannot use the water from the river for irrigation. Nguyen Hoang Co, vice head of the agriculture department of My Tu, said the salinity of water of the river has surged to 0.4 – 0.5 percent recently. Local residents have had to bathe with saline water first and rainwater later to save fresh water. 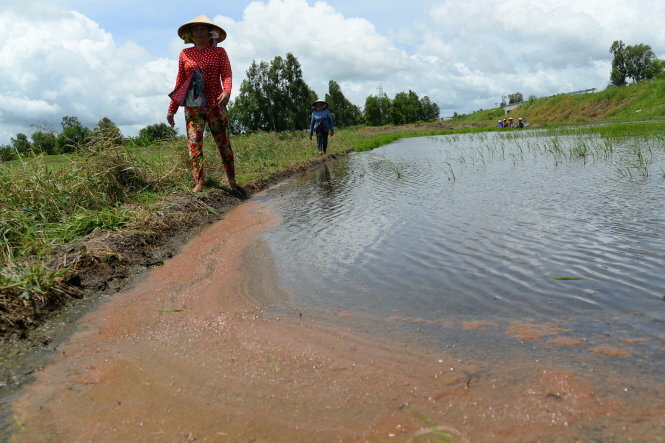 Le Phuoc Dai, head of the irrigation network unit of Hau Giang Province, admitted that the sudden increase of saline water in recent days has hit hard many areas of Soc Trang and Hau Giang Provinces. About 18,000 hectares of agricultural land in Hau Giang is now affected, he added. The situation is even worse in Kien Giang, Ca Mau and Bac Lieu Provinces, which border the sea. Farmers have fled from their rice fields to find other jobs in carpentry, sales, and others in cities. Doctor Le Anh Tuan, vice head of the Research Institute for Climate Change under Can Tho University, explained that the intrusion of saline water into rivers in the Mekong Delta is the result of the low fresh water level in those rivers. The upstream areas of the Mekong River in Laos and Thailand are now facing a severe drought, Tuan added. It is forecast that rain will come to these areas by at least the middle of next month, so the intrusion of saline water in rivers in Vietnam’s Mekong Delta will be alleviated by that time, he said.